Since returning from Peru, the Missus has been a bit obsessed with Quinoa. To the extent that we've been making Sopa de Quinoa(Quinoa soup) or Lamb and Quinoa Soup almost every week for the last 2 1/2 months! In fact, during that period we've been noticing that the price of quinoa has slowly risen; from 89 cents a pound....to $2.19 a pound. I believe that the Missus is the cause of this increase, her incessant demand has caused world-wide supplies to dwindle, a one woman quinoa consumption machine! A few days ago, the Missus asked me to make something different. I recalled a quinoa salad we had about 5-6 years ago....yes it is true, I can never remember where I parked my car....but ask me about a quinoa salad I had half a decade ago, and I'm "money". This was very easy, but there a few items of note; I used less water than usual for quinoa, the normal ratio is about 2 to 1, but because I wanted my quinoa to be "dry", I lowered the ratio. Also, when I tasted the "salad", I thought that I needed something with a bit of sweetness to balance out the flavors. Rather than adding sugar, I sliced some jicama that I had on hand which were used as "chips" to scoop up the salad. Also, the Missus wanted some seafood, so I sauteed some shrimp I had, and used that as a topping. As is duly noted in What we're eating. 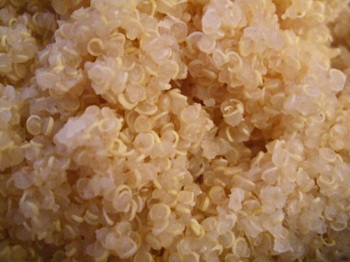 1 - Combine rinsed quinoa and water in a medium pot and bring to a boil. Stir once, lower to a simmer and cover for 8-12 minutes. 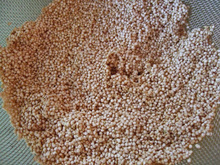 2 - When quinoa is cooked remove to a strainer or colander, "fluff and mix" to remove all moisture. Let cool. 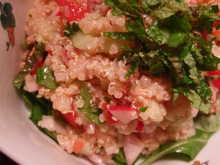 3 - When the quinoa has cooled and is "dry", transfer the quinoa to a large mixing bowl and add cucumber, onion, tomato, radish, and cilantro. Mix well. 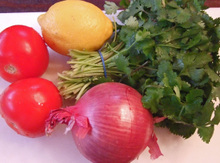 4 - Add olive oil, lemon juice, red wine vinegar, salt, garlic and pepper. Taste and adjust seasoning. 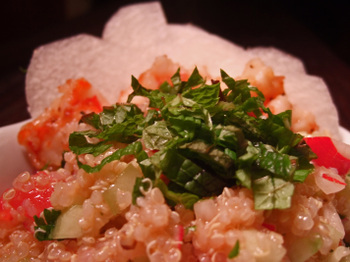 6 - Top with a chiffonade of mint, and serve on a bed of arugula, with slices of Jicama. mmmmm i do love me some quinoa. I've been leaving "quinoa" out for a sparrow on my lanai. I'm not planning to eat the sparrow or anything like that. mmm this looks healthy and delicious. I wish I had some quinoa. Oh, and I think all grains have risen in price due to the fuel price increases. a 146% rise in price over 2 1/2 months is *not* a slow increase! I always thought quinoa was a grain but I was told it's really seeds from a goosefoot. The salad looks very good, almost like a salsa. 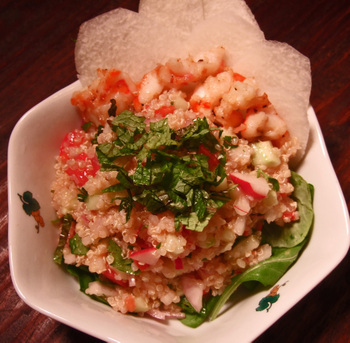 Hi Dave - Looks like a nice recipe - quinoa is very versatile. Hi RONW - I'm sure you now have some "super birds"!!!! Hi Carol - It's a nice refreshing salad, and I guess you can eat it like salsa! It seems that perhaps you've been in Japan so perhaps you'll know where I can get quinoa? I've just come across information about quinoa recently and my interest is piqued. Any help you can give would be great. Hi Colleen - I don't have a clue.....but let me see if there's someone who can help. Hey Kirk! Where do you normally get your quinoa? I got some of the white and the black quinoa over the weekend at Jimbo's and made white quinoa raisen muffins that are really good. Hi Carol - Because the Missus goes through about a pound(or more) of Quinoa a week, we just get it at Henry's. Thanks, Kirk. I know Whole Foods has them too. Jimbo doesn't sell in bulk. I'll look for it at my local Henry's.